‘Evoking Reality’ presents objects of political photography and video art from the Daimler Art Collection (DAC) that formulate new concepts of approaching current images of reality. Starting in the early 1990s, the DAC expanded the focus of its collection to works of new media: photography, video, object art and installations. The new acquisitions were presented in the three-part exhibition series ‘Photography, Video, Mixed Media I-III’ between 2003 and 2007 at the Daimler Contemporary exhibition space in Berlin. This focus on photography and video has been pursued intensively ever since. Today, the collection consists of a constantly growing portfolio of significant works that visualize contemporary perspectives on global issues and political conflicts. The exhibition ‘Evoking Reality’ is devoted to contemporary strategies that distance themselves from established principles of representation and popular narratives of photo journalism. These strategies create an open image of reality that aims for a critical sensitization in the observer. A critical consciousness is appealed to with regards to media’s methods of mediation and representation, which have shaped the modern eye with recurring images of suffering and scenes of violence for decades. Based on a re-reading of “Regarding the Pain of Others” (2003) by Susan Sontag, ‘Evoking Reality’ deals with current media and conceptual approaches to political, public and resulting private conflict situations. The interweaving of fiction, staging, construction and reality creates uncertainty in the observer, who experiences each strategy of alienation as unexpected and at the same time as an instance of reality creation. Openness and ambiguity encourage observers to work through the occurrences on their own, to reflect upon visual impulses and sometimes even to perform intellectual expurgation. Reality is experienced as a fragile construct that continuously changes its form from different perspectives. The works in this exhibition evoke a moment of reality that makes it possible to grasp the global reality of our lives through ambiguity, contradiction, interconnectivity and relativity. The recently acquired twelve-part photo series Congo Democratic (2006) by Guy Tillim, who received the ‘Mercedes-Benz Award for South African Art and Culture’ in 2004, will be seen in Berlin for the first time. 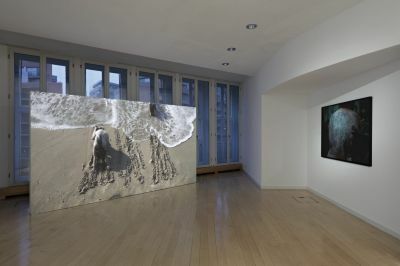 In addition, photographic works from artists including Jane Alexander, Clément Cogitore, Tacita Dean, Cao Fei, Pieter Hugo, Maya Zack and the video installations Snow White (2001) by Bernie Searle and Mermaids [Erasing the Border of Azkelon] (2011) by Sigalit Landau and The amorous Indies (2017) by Clément Cogitore are central elements of the exhibition.